Small rooms often exhibit poor low frequency response with significant emphasis at modal resonances. They also have limited space to make acoustical improvements. Porous surface absorption is ineffective at these modal frequencies, because the air motion near walls and in corners is essentially zero for these long wavelengths. The problem is solved by this unique membrane system that converts the high sound pressure fluctuations typically found in corners into selective absorption in the modal frequency range. Small rooms like Project Studios often suffer from low frequency modal problems. Absorption at these frequencies requires a high absorption efficiency and significant surface area. Since small rooms do not offer the needed space, the absorption efficiency must be optimized. 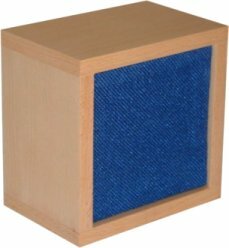 This product solves the problem by optimizing the absorption efficiency using a unique internally damped membrane absorber that provides ideal absorption in the modal frequency range. Sound (1) strikes the membrane (2) which sympathetically vibrates, converting the sound pressure to air (3) motion. The air loses velocity (4) as it moves through the internal absorber and air cavity. Now you absorb more bass in less space! Surface or corner applied porous materials lose efficiency at low frequencies, because the particle velocity or air movement associated with long wavelengths is low. The sound pressure, conversely, is at its maximum. The internally damped membrane in the Modex Bass Trap exploits this high pressure by converting the pressure fluctuations into air motion. As the membrane sympathetically vibrates over a selective low frequency range, determined by its mass and stiffness, it pushes air through an internal porous layer producing low frequency absorption. This innovative approach makes it possible for the Modex Bass Trap to absorb the fundamental and higher harmonic modes that are often problematic in small rooms. While membrane absorbers can be designed for a specific frequency and offer a high absorption efficiency, their bandwidth or range of frequencies over which they are effective is limited. One can broaden the Q of the system by introducing damping in the air cavity, but this is accompanied by lowering the maximum absorption efficiency. RPG has taken a different approach to provide absorption in the modal range. By systematic impedance tube testing, RPG has optimized the membrane mass, compliance and cavity depths that offer maximum absorption efficiency at the third octave center frequencies of 40, 50, 63 and 80 Hz. To cover the 40-80 Hz frequency range, one can simply combine Modex modules, thus providing 100% efficiency. Specific modal problem frequencies can also be addressed with individually tuned modules. The Modex Bass Trap can be simply mounted, directly onto walls or ceilings, using the supplied split battens. The split batten is screwed onto the wall and the unit is simply hung on the batten. A modfied version is also available for ceiling mounting with side 'wings' for screw fixings. This unit can also be used for wall mounting if the whole array is to be fabric covered complete on site. Please Note: These units only have a 0.36m² surface area per unit. Generally this is very small in relation to the overall surface area within a small room. We have found that a pair of traps in the optimum placement will give a 1-2dB dip so generally at least 6 units are needed.